Standing among the broken bodies of those forced from the 9 stories above, a NYC police officer looks up to the flames still pouring out of the Asch Building. Though a coincidence, the Triangle Fire of 1911 is memorialized each March, designated as Women’s History Month. While on each anniversary of the March 25 inferno that claimed 146 lives we remember those who died as innocent victims – which they were – there is a greater theme, one played out again and again throughout American history. There are familiar parallels shared by all minority groups seeking recognition as deserving of basic human rights. Those making up a collective majority, therefore those who have achieved a voice of power within the social order of the day do not represent the true promise of democracy. The Triangle Waist Fire is part of an on-going narrative of how a distinct underclass, in this case of women, mostly poor, young, mostly non-protestant, recent immigrants from Eastern Europe, realized that waiting for the majority to act was futile. Contemporary accounts often minimize or fail to mention the harrowing stand made by women working in manufacturing during the early 1900s as the cause for securing worker rights now accepted as routine. Today’s standard of basic workplace conditions and compensation did not come easily, or without a high price. Finally, the Triangle Fire serves as prologue. Though the disparity between the poorest and the affluent was both distinct and brutal in 1911, it pales by comparison with today’s escalation of wealth inequality. The response to the scenes of the broken and charred bodies was initiated, not by a sudden awareness of the causes of the tragedy. These were all well known by those in positions of privilege long before the smoke appeared on the eighth floor of the Asch Building. The conditions that killed garment makers, steel and mine workers were tolerated by all but those most dependent on society to act, those who died. 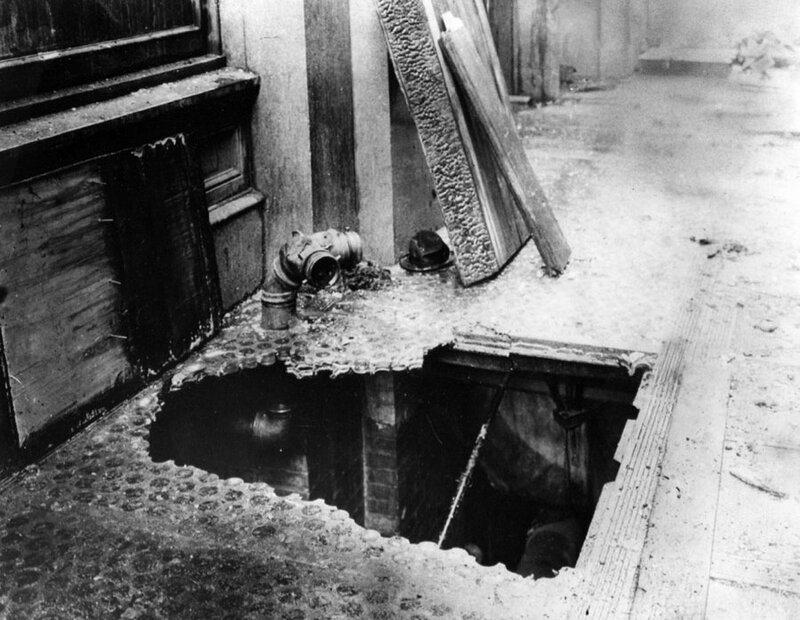 Six of the victims would remain unidentified until a full century later, a cruel metaphor for the 20,000 shirtwaist workers in New York at that time. For the complement of the other 140 dead, some became known to survivors only by the braid of singed hair, dental work or a ring, a family heirloom brought from Russia, or Italy or perhaps Poland. 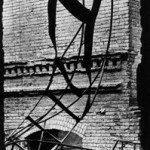 The details of the Triangle Waist Company Fire are well documented with most of the material facts revealed relatively soon after the event of March 25, 1911. The source of the fire will never be definitively known, but a carelessly discarded match or cigarette remain a common guess and one that has its own appeal for any desire to deflect culpability onto the dead. For an industry in which a seamstress might routinely work sixty to more than eighty hours during a seven day week, (pay docked for time taken to attend religious services), that Saturday afternoon workday was ending at five. It was only twenty minutes before the end of work when smoke was noticed on the 8th floor of the ten story Asch Building in Greenwich Village. That floor and the two above were occupied by the Triangle Waist Company and on each floor’s loft worked nearly 500 employees of owners Isaac Harris and Max Blanck. 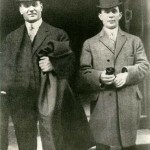 Like many of their own employees, both owners had emigrated from Russia and subsequently built not only a profitable company, but a reputation as the Shirtwaist Kings. The shirtwaist was the popular, tapered blouse ubiquitous among women of all classes who enjoyed the stylish look of the time. 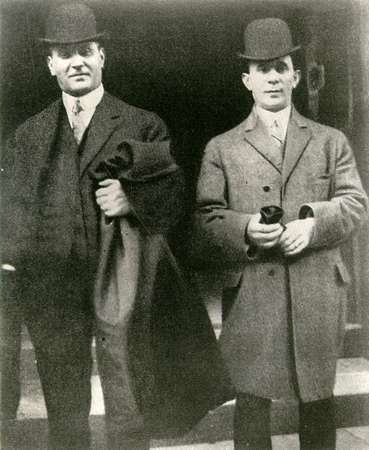 By 1911, Harris and Blank were facing increased competition from the other 500 shirtwaist manufacturers in New York alone and from changing styles that were cutting into the popularity of the shirtwaist. What they didn’t face was much regulatory oversight by any level of government, all of which looked favorably upon the business owner and with stern disdain for any semblance of organized workers. Among the several reasons the emergency exit on the 9th floor was locked was the precaution against any chance that union organizers might find their way in to speak to the employees. The owners had successfully rebuffed a strike by 20,000 shirtwaist worker more than a year earlier. The Triangle Waist Company remained an open shop with no obligation to even hear grievances by workers of unsafe working conditions, let alone pay and work hour matters. It was also customary to have foremen inspect the handbags of the women as they would depart the floor at the end of each shift, all in single file passing through the exit unlocked only for the survey of managers looking for pilfering and theft. The three floors, the lower two used for manufacturing, the tenth for managerial operations, communicated by means of a switchboard located on the tenth floor. 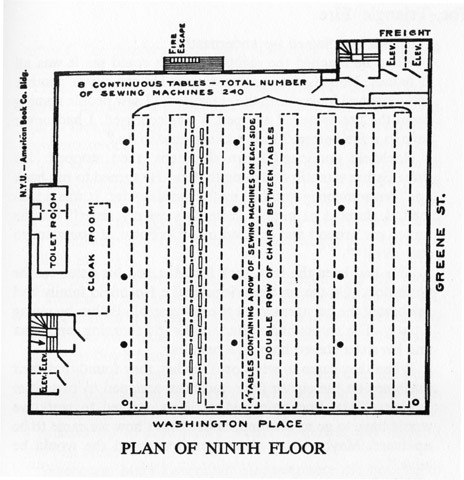 When eighth floor worker Dinah Lifschitz bravely remained long enough to call the switchboard and give the alarm at roughly 4:40 p.m., (the regular operator was not at work that Saturday), the woman who answered left the set to alert the owners of the fire and never returned to warn the workers on the 9th floor. It was on this floor from which most of the fire’s victims were taken. Only two workers from the 10th story died. The owners, whose children had come to visit that day, escaped with the employees from that floor by moving to the roof and escaping to an adjoining building. 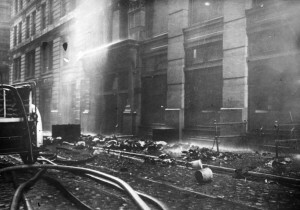 Most workers on the 8th floor managed to escape by the two freight elevators that continued to operate, rescuing workers until the heat of the fire buckled the tracks. By that time, though, few left on the 8th floor remained alive. 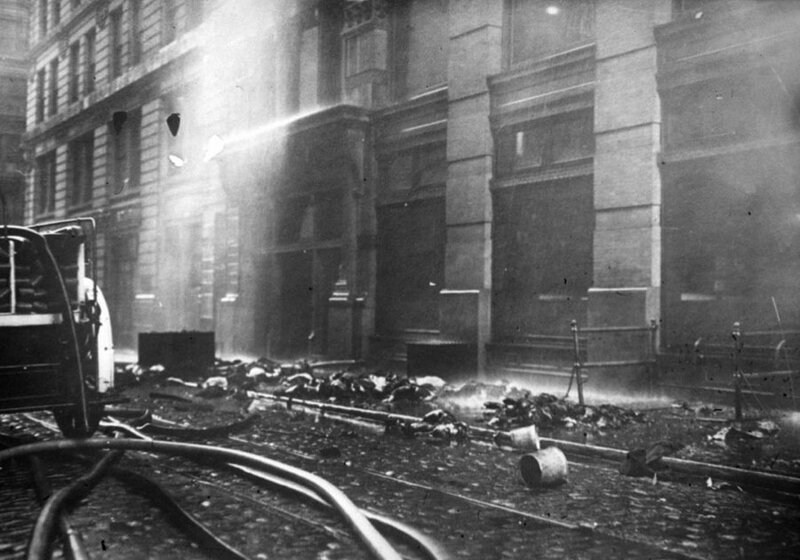 For those as for scores on the floor above, a windowsill and the 90 foot drop to the street below was the only escape from the searing flames. One of the hundreds who’d gathered on the streets below the Triangle lofts was United Press reporter William Shepherd who recorded in words his experiences as he watched helplessly. As I looked up I saw a love affair in the midst of all the horror. A young man helped a girl to the window sill. Then he held her out, deliberately away from the building and let her drop. He seemed cool and calculating. He held out a second girl the same way and let her drop. Then he held out a third girl who did not resist. I noticed that. They were as unresisting as if he were helping them onto a streetcar instead of into eternity. Undoubtedly he saw that a terrible death awaited them in the flames, and his was only a terrible chivalry. Then came the love amid the flames. He brought another girl to the window. Those of us who were looking saw her put her arms about him and kiss him. Then he held her out into space and dropped her. But quick as a flash he was on the window sill himself. His coat fluttered upward-the air filled his trouser legs. I could see that he wore tan shoes and hose. His hat remained on his head. 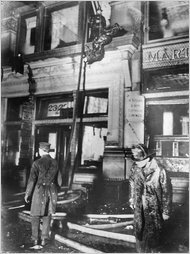 More than twenty workers died when the fire escape ladder onto which they’d sought escape detached from the building, plunging its occupants nearly one hundred feet to their deaths. With two minutes remaining in the workday, the fire had done its work. 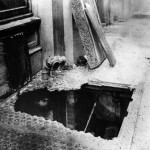 On Washington Place and Greene Street below were piled nearly a hundred crushed bodies of those who last moment of determination was to leave for their families a body for burial. Firefighters initially tried to break the fall of those who jumped, but the laws of physics multiplied the weight of the workers as they plummeted through space. The nets gave way as if made from tissue when the falling bodies exceeded by many times the ability of the devices to capture the workers. Glass portions of the sidewalk were likewise penetrated by human missiles that finally came to rest in the Asch Building’s cellar. It was about midnight when the last remains of those who died on the 8th and 9th floors were lowered by block and tackle to the streets below. 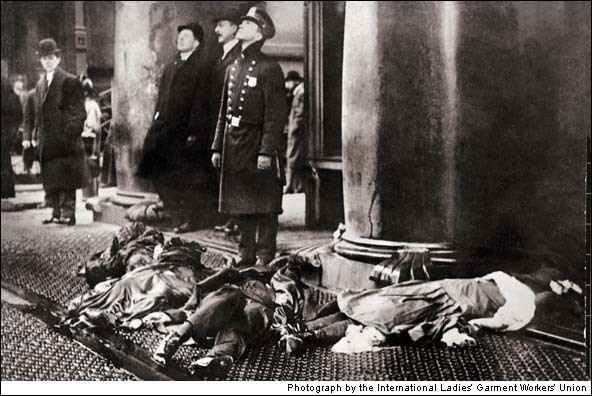 Policemen, no doubt some who had clubbed striking shirtwaist workers in late 1909, collected personal effects that would help in identifying the dead before being returned to loved ones. 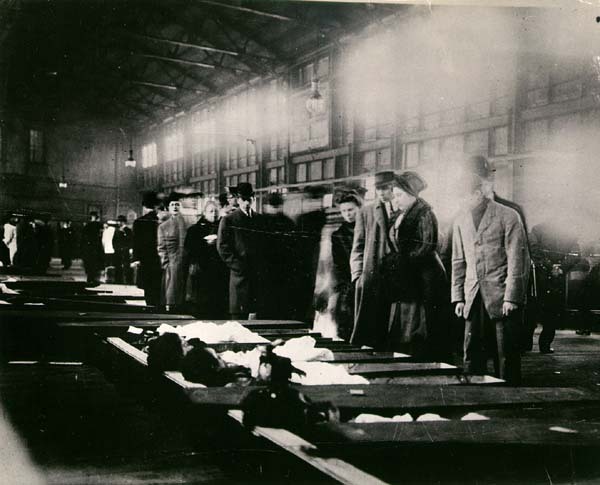 At first, the bodies were taken to the Bellevue Morgue, which was quickly filled to capacity. 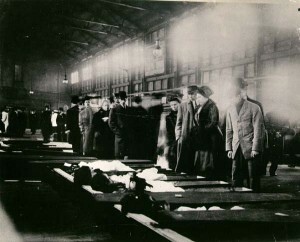 In a warehouse located on an adjoining pier, a makeshift morgue and police station was established. The following day began the heart-wrenching process of identifying the dead. The bodies were placed in simple coffins, the heads of those still recognizable were propped up so as to be more visible to the lines of grieving viewers searching for their lost ones. Several of those who jumped did survive the terrible fall. The lingered for hours and one for a few days until they, too, joined the ranks of their dead co-workers. On April 5, a new post will pick up where today’s entry pauses. The trials, both criminal and civil, against the owners will be discusses. The effect the Triangle Fire had on the labor movement will also be a major topic as will the great shirtwaist worker strike of 1909, an event referenced in this post. Once again, in keeping with the theme of history as prologue, the full circle of manufacturer’s success in ensuring open shops, or right to work laws, as was the case for the Triangle Waist Company employees, will be examined. For today, however, I ask that we don’t look away from not only the events of March 25, 1911, but from the lessons still waiting to be applied a century after the Triangle Fire. the wilted nosegay pinned to her collar. nine stories to the street. in the sky’s deliberate mirror. a disposition of her life. or modest as you passed me by. of ashes in my own. Editor’s Note: The final section of The Triangle Fire, Cortege, will appear in the April 5 post.